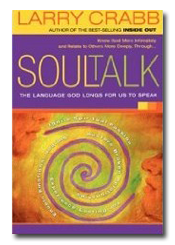 Author and well-known psychologist, Dr. Larry Crabb, describes a more meaningful form of communication in his best-selling release, SoulTalk, now available in trade paper. So many times we open our mouth to speak without a single thought of the impact it will have on another’s life. We chat, argue, gossip, flatter, maneuver, preach, strategize and tell wonderful stories. But too often it is only talk – and seldom the kind of meaningful conversations for which we were created. "Out of the same mouth proceed blessing and cursing," the Bible tells us. With SoulTalk, we can learn to touch each other’s souls in a way that brings growth, meaning, belonging and great joy – a blessing.